After only two trips to South Dakota, I can't help but believe the state has it in for me! 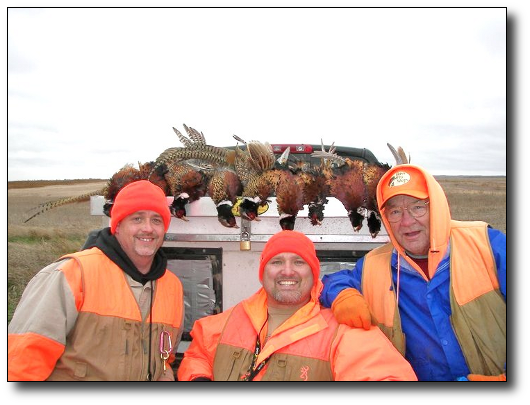 Last year I made the trip with an HSP group on opening day of the pheasant season. 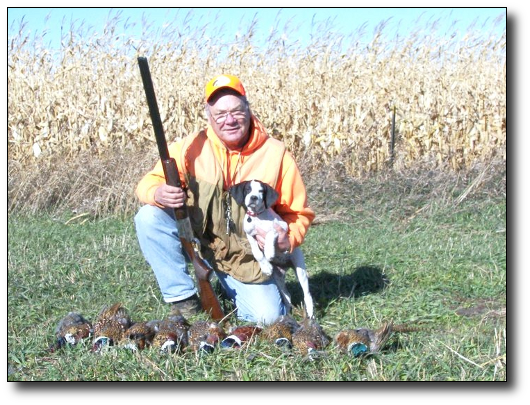 The number of pheasants was incredible. The problem was that the corn was NOT harvested! 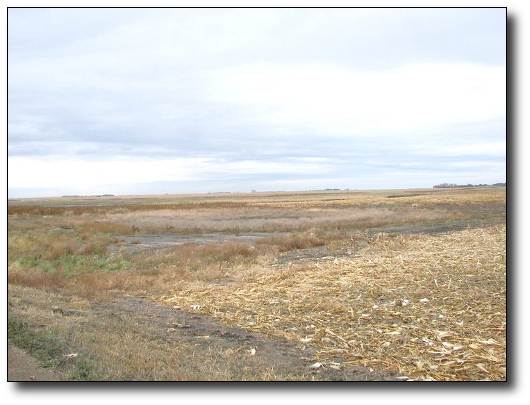 For the first time in over 20 years, around 90 percent of the corn was still in the fields. This was due to extended rain-fall. 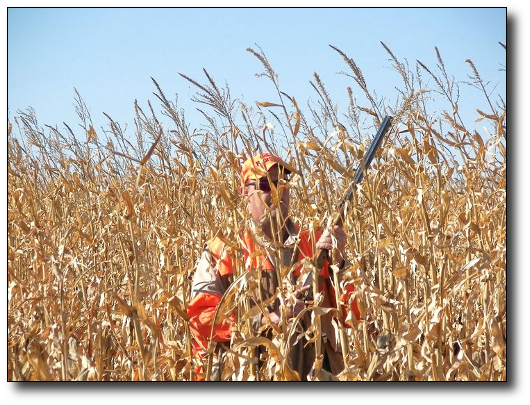 Of course any pheasant hunter worth his salt knows that trying to hunt pheasants in standing corn is quite a challenge, too much for this old guy, and his old dog! So this year, we waited an extra week, and decided early on to stay a full 5 days. 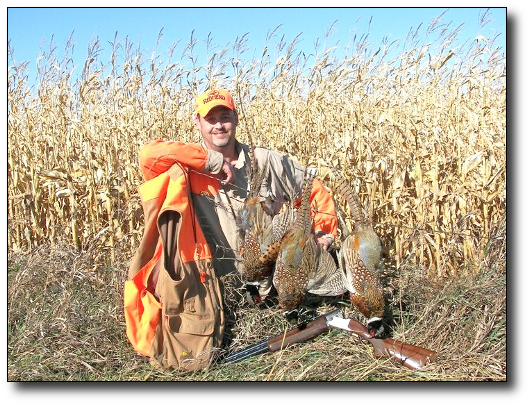 The pheasant population was estimated to be a bit above the normal average. Still, finding a motel close to the area we planned to hunt was quite an undertaking. Advance planning is a must, especially during the first two weeks. This group consisted of 4 club members, Dan, Brian, Fred and Dave. Fred drove separately and planned to leave early. We had Brian's extended cab pickup and pulled a trailer. 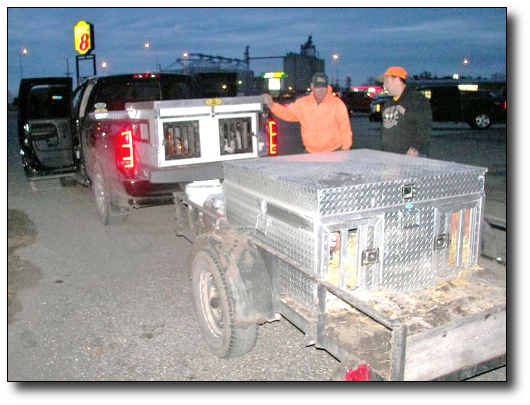 One dog-box was in the back of the pickup, the other dog-box on the trailer, with plenty of room for equipment. 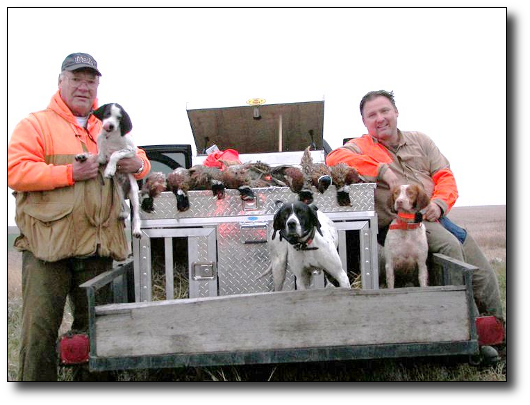 We had 8 dogs with us, 4 English Pointers, (Dan's Gus, Brian's Babes, 2 English Pointer pups), 2 Brittany's, Brian's Hermes and Eric's Buz. (Eric did not go but asked Brian to take him and evaluate). Dan's had 2 German Shorthairs Rex and Lady. Fred had his Pointing Lab (Champ) with him. We had plenty of dog power. Dan and Brian planned to rotate their dogs, keeping fresh ones in the field. 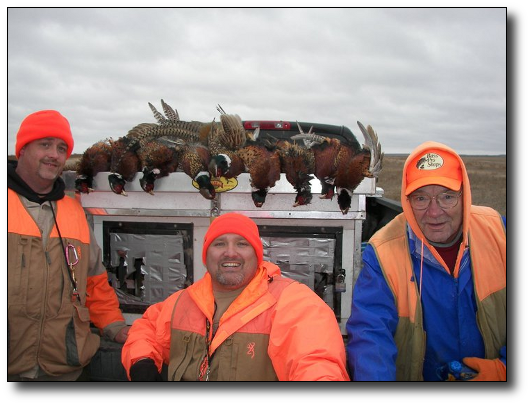 With 5 days of hunting planned, rotating not only kept them fresh, but helped keep injuries to a minimum. What greeted us was quite nerve shattering! On the morning of the third day, I recall waking to the weather news spewing from the T.V. "Not since the sinking of the Edmund Fitzgerald, has there been such an early, massive, low pressure system." The weather system we faced was a "record setter!" Sustained winds at 40 to 45 MPH, with gusts to 55 MPH! Temperatures were going to be in the 30's with rain mixed with snow. If that wasn't bad enough, this weather system was going to continue "through the following day." The temperatures were going to drop into the lower 20's. Fred headed for home the evening of the second day. Sure, we could have opted to stay in, keep warm and drink coffee all day. "Nope, not these guys!" "This weather will bunch them up and make them sit tight!" We bundled up, bought what extra clothes or equipment we needed, and came up with a game plan! Corn was the key. CRP or thick grass near corn is what we found to hold birds. Dan and Brian would work towards the blocker (me). "Split second shooting" is the only word that begins to describe the fast action. Seldom would only one bird be flushed from a weedy patch. 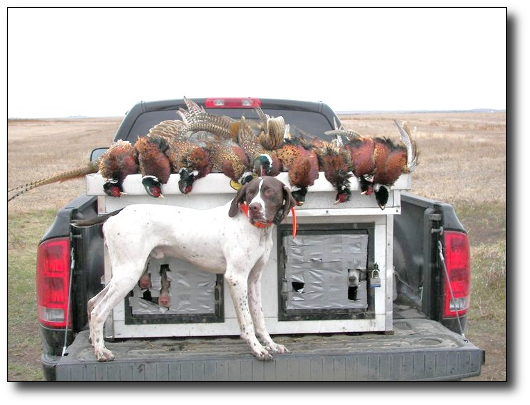 My guess is that we averaged 4 roosters and two hens, per selected prime spots. The number of pheasants observed when driving from one HSP section to another just amazed me. Three separate times when just slowing down, caused pheasants to flush. 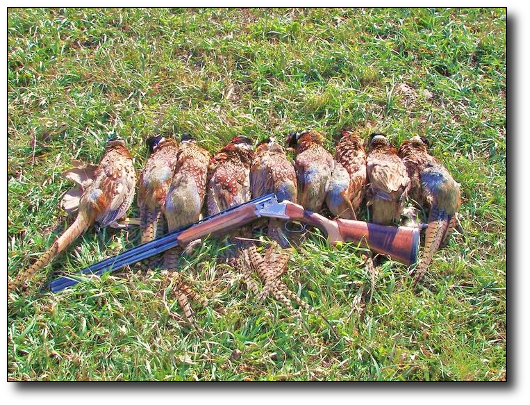 A 40 to 60 acre CRP field, on both sides of the road erupted with what had to be 100 pheasants. Just unbelievable! Our main problem was not the lack of shots or lack of roosters. It was "getting out of the car!" As you opened the door, the wind would catch it and pull you out. The next time, with the wind pushing against the door, you couldn't open it! We tried to limit ourselves (mainly me), to 15 minutes out in the elements. "One foot forward and two back," accurately describes my ability to get around in that weather. Dan and Brian knew that, so I was the designated blocker. That was fine with me. I had my share of shots, although most of the time the target was in the next county by the time I fired. 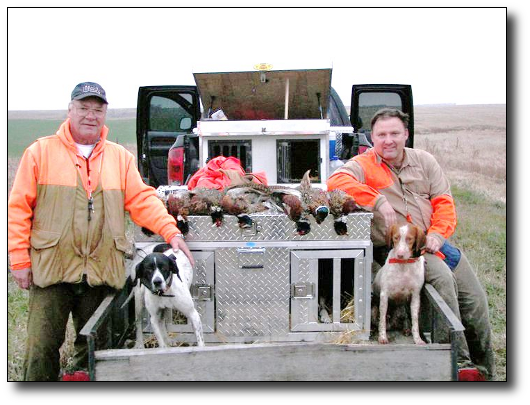 Another option available in South Dakota is roadside ditch hunting. 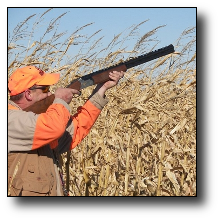 It is completely legal to hunt the roadside right-of-way. If you need a break or just driving from one farm to another and a rooster is spotted hiding in a ditch, it is legal to exit the car, load your gun and harvest him. Trip to remember? Yes, without a doubt. We ended up three birds shy of our legal, 5 day possession limit. 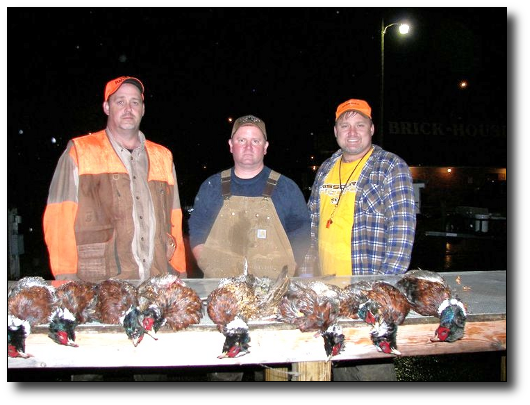 3 Hunters times 5 days equals 15. So, 15 birds each equal 45. We came home with 42. Do I still feel the state has it in for me? Well yes, although I have mellowed since warming up, having a nice hot meal, and looking at the pictures. Would I go back? Yes, in a heartbeat! South Dakota has 'em! 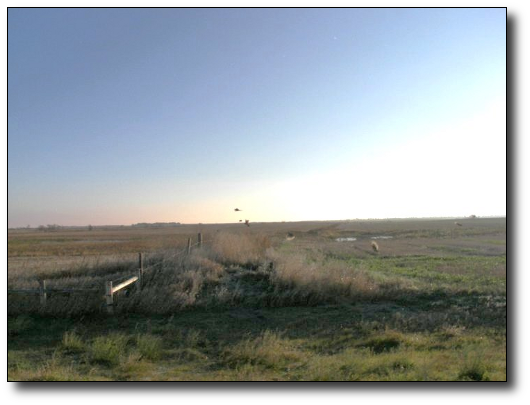 HSP has several farms with numerous sections in the heart of pheasant country. Go get 'em! L to R - Dave w/pup (AMY); Babes' Middle; Dan w/Hermes. 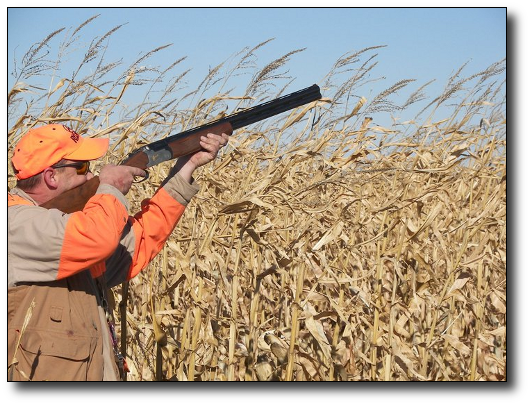 Corn and CRP - how perfect!